Christiaan Huygens was born in The Hague on April 14th, 1629, to a rich and influential Dutch family. Christiaan was the second son of Constantijn Huygens and Suzanna van Baerle, who named Christiaan after his paternal grandfather. Constantijn – a famous poet, composer and adviser to the House of Orange – was friends with many contemporary philosophers, including Galileo Galilei, Marin Mersenne, and René Descartes. His father’s connections and personal affiliations allowed for Christiaan to receive a comprehensive schooling in the arts and sciences and set him down the road to becoming an inventor and astronomer. Until he was sixteen, Christiaan was home-schooled and received a liberal education, studying languages, music, history, geography, mathematics, logic, rhetoric, and also dancing, fencing and horse riding. In 1645, Christiaan was sent to study law and mathematics at the University of Leiden, in the south of The Netherlands. After two years, Huygens continued his studies at the newly-founded College of Orange in Breda, where his father was a curator, until graduating in 1649. While his father had hoped that he would go on to be a diplomat, Christiaan’s interest in mathematics and the sciences were evident. In 1654, Huygens returned to his father’s house in The Hague, and began devoting himself entirely to research. Much of this took place at another house his family owned in nearby Hofwijck, where he spent much of the summer. Huygens developed a broad range of correspondents at this time, which included Mersenne and the circle of academics he had surrounded himself with in Paris. By 1655, Huygens began visiting Paris on multiple occasions and took part in debates held by the Montmor Academy – which had taken over from the Mersenne circle after his death in 1648. While at the Montmor Academy, Huygens advocated the scientific method and experimentation over traditional orthodoxies and what he saw as amateurish attitudes. In 1661, Huygens made his first visit to England, where he attended a meeting of the Gresham College group – a society of scientists influenced by the new scientific method (as espoused by Francis Bacon). In 1663, Huygens became a Fellow of the Royal Society, which succeeded the Gresham Group, and met such influential scholars as Isaac Newton and Robert Boyle, engaging in many debates and discussions with others of their ilk. In 1666, Huygens moved to Paris and became one of the founding members of Louis XIV’s new French Academy of Sciences. While there, he used the Paris Observatory to make his greatest discoveries in the field of astronomy (see below), conducted correspondence with the Royal Society, and worked alongside fellow astronomer Giovanni Cassini (who discovered Saturn’s moons Iapetus, Rhea, Tethys and Dione). His work with the Academy granted him a pension larger than that of any other member and an apartment in its building. Apart from occasional visits to Holland, he lived in Paris from 1666 to 1681 and made the acquaintance of the German mathematician and philosopher Gottfried Wilhelm Leibniz, with whom he remained on friendly terms for the rest of his life. From 1652-53, Huygens began to study spherical lenses from a theoretical point of view, with the ultimate aim of understanding telescopes. By 1655, in collaboration with his brother Constantijn, he began grinding and polishing his own lenses, and eventually designed what is now called the Huygenian eyepiece – a telescope ocular consisting of two lenses. 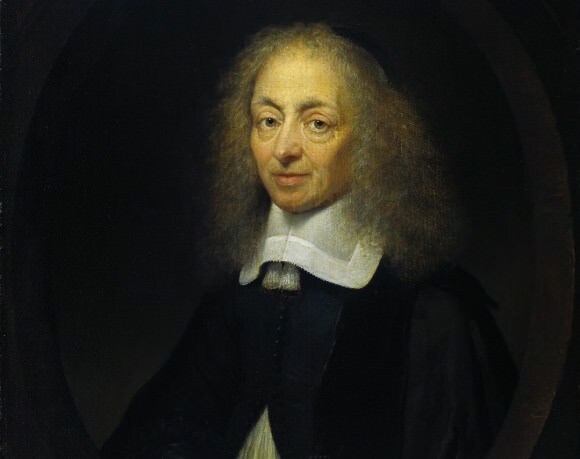 By the 1660s, his work with lenses allowed him to meet socially with Baruch Spinoza – the famous Dutch philosopher, scholar, and rationalist – who ground them professionally. Using these improvements he introduced in lenses, which he in turn used to build telescopes of his own, Huygens began studying the planets, stars, and the universe. It was also in 1655 that he became the first astronomer to observe the largest of Saturn’s moons – Titan. At the time, he named the moon Saturni Luna (Latin for “Saturn’s moon”) which he described in his tract entitled De Saturni Luna Observatio Nova (“A New Observation of Saturn’s Moon”). In the same year, he used his modern telescope to observe the Orion Nebula and successfully subdivided it into different stars. He also produced the first ever illustration of it – which he also published in Systema Saturnium in 1659. Because of this, the brighter interior region was named the Huygenian region in his honor. Shortly before his death in 1695, Huygens completed Cosmotheoros, which was published posthumously in 1698 (due to its rather heretical propositions). In it, Huygens speculated about the existence of extraterrestrial life on other planets, which he imagined would be similar to that of Earth. Such speculations were not uncommon at the time, thanks in part to the Copernican (heliocentric) model. But Huygens went into greater detail, stating that the availability of water in liquid form was essential for life and that the properties of water must vary from planet to planet to suit the temperature range. He took his observations of dark and bright spots on the surfaces of Mars and Jupiter to be evidence of water and ice on those planets. Addressing the possibility of Scriptural challenges, he argued that extraterrestrial life was neither confirmed nor denied by the Bible, and questioned why God would create the other planets if they were not meant to be populated like Earth. It was also in this book that Huygens published his method for estimating stellar distances, based on the assumption (later proven incorrect) that all stars were as luminous as the Sun. In 1659, Huygens also stated what is now known as the second of Newton’s laws of motion in a quadratic form. At the time, he derived what is now the standard formula for the centripetal force, exerted by an object describing a circular motion, for instance on the string to which it is attached. In mathematical form, this is expressed as Fc = mv²/r, where m the mass of the object, v the velocity and r the radius. The publication of the general formula for this force in 1673 – though related to his work in pendulum clocks and not astronomy (see below) – was a significant step in studying orbits in astronomy. It enabled the transition from Kepler’s third law of planetary motion to the inverse square law of gravitation. His interest, as an astronomer, in the accurate measurement of time also led him to the discovery of the pendulum as a regulator for clocks. His invention of the pendulum clock, which he prototyped by the end of 1656, was a breakthrough in timekeeping, allowing for more accurate clocks than were available at the time. In 1657, Huygens contracted clock makers in the Hague to build his clock and applied for a local patent. In other countries, such as France and Britain, he was less successful, with designers going as far as to steal his design for their own use. However, Huygen’s published work on the concept ensured that he is credited with the invention. The oldest known Huygens-style pendulum clock is dated 1657 and can be seen at the Museum Boerhaave in Leiden (shown above). In 1673, Huygens published Horologium Oscillatorium sive de motu pendulorum (Theory and Design of the Pendulum Clock), his major work on pendulums and horology. In it, he addressed problems raised by previous scientists who considered pendulums not to be isochronous – i.e. their period depending on the width of their swing, with wide swings taking slightly longer than narrow swings. Huygens analyzed this problem using geometric methods (an early use of calculus), and determined that the time it takes is the same, regardless of its starting point. Furthermore, he solved the problem of how to calculate the period of a pendulum, describing the reciprocal relationship between the center of oscillation and the pivot point. In the same work, he analyzed the conical pendulum – a weight on a cord moving in a circle that uses the concept of centrifugal force. Huygens is also credited for developing a balance spring watch, in the same period as Robert Hooke (1675). Controversy over who was the first has persisted for centuries, but it is widely believed that Huygen’s development occurred independently of Hooke’s. Huygens is also remembered for his contributions to optics, especially for his wave theory of light. These theories were first communicated in 1678 to the Paris Academy of Sciences and were published in 1690 in his “Traité de la lumière“ (“Treatise on Light“). In it, he argued a revised version of Descartes views, in which the speed of light is infinite and propagated by means of spherical waves emitted along the wave front. Also published in 1690 was Huygen’s treatise on gravity, “Discours de la cause de la pesanteur” (“Discourse on the Cause of Gravity“), which contained a mechanical explanation of gravity based on Cartesian vortices. This represented a departure from Newton’s theory of gravity, which – despite his general admiration for Newton – was held by Huygen’s to be devoid of any mathematical principle. Other inventions by Huygens included his design of an internal combustion engine in 1680 that ran off of gunpowder, although no prototypes were ever built. Huygens also built three telescopes of his own design, with focal lengths of 37.5, 55 and 64 meters (123, 180, and 210 feet), which were later presented to the Royal Society. Huygens moved back to The Hague in 1681 after suffering from a serious bout of depressive illness, which had plagued him throughout his life. He attempted to return to France in 1685, but the revocation of the Edict of Nantes – which allowed French Protestant (The Huguenots) freedom to practice their religion – precluded this. When his father died in 1687, he inherited Hofwijck, which he made his home the following year. In 1689, he made his third and final visit to England, seeing Isaac Newton once more for an exchange of ideas on motion and optics. He died in The Hague on July 8th, 1695, after suffering from ill health, and was buried in the Grote of Sint-Jacobskerk – Great or St. James Church, a landmark Protestant church in The Hague. For his life’s work and contributions to many fields of science, Huygen’s has been honored in a variety of ways. In acknowledgment for his time at Leiden University, the Huygens Laboratory was built, which is the home of the university’s Physics department. The European Space Agency (ESA) also created the Huygens-building, which is located across from the European Space Research and Technology Center (ESTEC) in the Space Business park in Noordwijk, Netherlands. Radbound University, located in Nijmegen, Netherlands, also has a building named after Huygens, which is one of the major buildings of the university’s science department. The Christiaan Huygens College, a high School located in Eindhoven, Netherlands, is also named in his honor, as is the Huygen Scholarship Programme – a special bursary for international and Dutch students. There is also the two-element ocular eyepiece for telescopes designed by Huygens, which is therefore known as Huygenian eyepiece. A microscope image processing package, known as Huygens Software, was also named in his honor. In honor of both Christiaan and his father, another renowned Dutch scholar and scientist, the Netherlands National Supercomputer facility in Amsterdam created the Huygens Supercomputer. And because of his contributions to the field of astronomy, many celestial objects, features and vehicles have been named after Huygens. These include Asteroid 2801 Huygens, the Huygens crater on Mars, and Mons Huygens, a mountain on the Moon. And of course, there is the Huygens probe, the lander used to survey the surface of Titan, as part of the Cassini–Huygens mission to Saturn. Universe Today has many interesting articles on Christiaan Huygens and his discoveries. For instance, here’s one acknowledging Christiaan Huygens’ 375th birthday, an article on Saturn’s Moon Titan, and details on the Huygen’s mission and what it revealed about Titan’s atmosphere. For more information, check out NASA’s Solar System Exploration page on Christiaan Huygens and a biography of Christiaan Huygens.